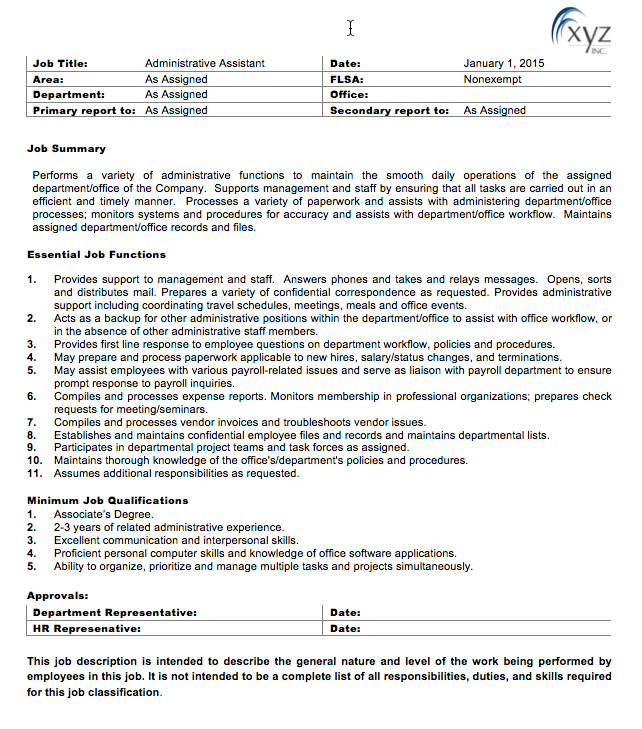 The previous article on Job Description Format discussed the important sections and elements of a job description. These include: 1) Identifying Information, 2) Job Summary, 3) Job Responsibilities, 4) Job Requirements, 5) Approvals, and 6) Disclaimer Statement. The example below gives an idea of how this might look for a “generic” job description, namely, one that can be used in multiple departments. If you are creating a job description format from scratch, an online search will turn up numerous samples to choose from. As long as most if not all of the sections above are included, there is no right or wrong format and it is largely a matter of personal preference. However, when developing a job description format, keep in mind the ease of use and updating, as job descriptions will change frequently and being able to make individual and/or global changes is important.